Interest rates have gone down in recent decades and neared zero after the financial crisis of 2008. Many economists believe that interest rates will go up again at some point. But what if that doesn't happen? What if low and negative interest rates become the new normal? Several factors contributed to low interest rates. These factors do not go away when interest rates reach zero. Lower interest rates make more projects economical so that there can be more capital and wealth. In this way lower interest rates can help to end poverty and make the economy sustainable. Lower interest rates are beneficial to most people as they pay more interest than they receive. Interest is hidden in rents, taxes, and the price of everything we buy. Why do we have interest? This has to do with supply and demand of funds. Lending and borrowing weren’t possible without interest. If you lend out money, you can't use it yourself. People want a compensation for this inconvenience. And the borrower may not repay. People want a compensation for this risk. Finally, if you can make a profit by investing, then why lend out money without interest? In the meantime a few things have changed. You can lend money to a bank and still use it any time. This is convenient. Banks check the financial condition of borrowers and lend to many different people. This reduces risk. Central banks and governments can help out banks if needed. And so bank deposits are now considered safer than cash. But what about investments? Throughout history the returns on investments were mostly higher than the economic growth rate. Most of these returns have been reinvested so a growing share of total income was for investors. This cannot go on forever because who is going to buy the goods and services corporations make? A simple example can illuminate that. 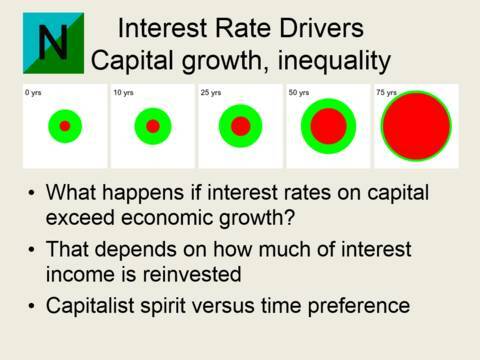 Figure 1 shows how total income and interest income (in red) develop with an economic growth rate of 2% and an interest rate of 5% when interest income starts out as 10% of total income and all interest income is reinvested. After 25 years the economic pie has grown faster than interest income and wages have risen. At some point interest income starts to rise faster than total income, and wages go down. After 80 years there's nothing left for wages. This model explains a lot about what is going on in reality. Income inequality can hamper the economy. This can be called usury for good reason. It also explains why interest rates went down in recent years. In the short run it was possible to prop up business profits and interest rates by letting people go further into debt to buy more goods and services. In the long run, the growth rate of capital income cannot exceed the rate of economic growth. This problem emerged several times already. In the past economic crises and wars destroyed capital and created new room for growth. There is an alternative to economic crises and wars. It is allowing interest rates to go negative. This is why the era of low and negative interest rates may be upon us. The end of usury could be near. Economists and the public at large should become aware of this. There is a lot of research that needs to be done. Negative interest rates may be the next big thing in economics and an era of peace and prosperity may be upon us. The End Of Usury was one of two papers presented at the IV International Conference on Social and Complementary Currencies in Barcelona in 2017. The other one was Feasibility of Interest-Free Demurrage Currency that deals with implementing interest-free money with a holding tax in the global financial system. Interest-free currency with a holding tax can become the money of the future. Not so long ago more than 99% of the world population lived in abject poverty. Most people had barely enough food to survive. In 1651 the philosopher Thomas Hobbes depicted the life of man as poor, nasty, brutish, and short. It had always been that way. Yet, a few centuries later a miracle had happened. Nowadays more people suffer from obesity than from hunger while the life expectancy in the poorest countries exceeds that of the Netherlands in 1750, which was the richest country in the world just before the Industrial Revolution started. This miracle is the outcome of an epic battle between 'The Spirit of Capitalism' versus 'Time Preference' that raged for centuries. Capitalists are special people. They believe that money spent on frivolous items is money wasted. If you invest your money, you will end up with more money that you can invest again. Hence, capitalists often end up owning a lot of money when they die. What's the point of that? Capitalists invest in the businesses that make the items ordinary people enjoy. Ordinary people wouldn’t have invested their money, but spent it instead on frivolous items so that these items wouldn’t have been produced in the first place. That is because they suffer from time preference, a condition that makes them spend their income sooner rather than later. When time preference prevailed, there were few savings and interest rates were high. People were poor because there was no money for investments. When the capitalist spirit got the upper hand, there were lots of savings, interest rates were low, and people were wealthy because there was an ample supply of investment money. As the wealthy save and invest while the poor borrow and spend, wealth inequality is a rather unsurprising outcome. Most people pay more interest than they receive. Interest is hidden in rents, taxes, and the price of everything we buy. Lower interest rates therefore benefit most people. Low interest rates are the result of an abundance of capital, products and services or trust in the currency, or a lack of investment options. With low interest rates more projects become economical, for instance investments in renewable energy and the infrastructure in poor areas. With negative interest rates poverty can be gone and the economy can become sustainable. In the wake of the financial crisis interest rates hit the zero-lower bound. Investors prefer liquidity because returns on other investments are deemed less attractive. In other words, many people, businesses and banks pile up cash, and don’t invest or spend. Time preferences are too low so that money and capital markets are in disarray. Central banks have created a lot of currency to meet the demand for liquidity, for example via quantitative easing. But central banks are running out of options. Ending the next recession may require negative interest rates. Negative interest rates can clear the supply and demand for money and capital at the equilibrium level that matches planned savings and planned investments. Most economists think that negative interest rates are temporary and that interest rates will go up again. That may not happen unless leaders make mistakes that result in the destruction of capital, for instance by causing economic crises and wars. Low and negative real interest rates can become the new normal. This is related to the secular stagnation hypothesis which claims that growth and interest rates may remain low for a longer timeframe. This paper comes up with an explanation that economists tend to overlook. It is usury. Usury is an underlying driver of income inequality and financial instability. In the past average interest rates were in excess of the economic growth rate. When most investment income is reinvested such rates can be long term unsustainable and may be called usurious. As wealthy people tend to save more, most capital tends to end up in the hands of a relatively few people who reinvest most of their capital income. As a consequence, wealth induced income inequality can hamper economic growth. This may have contributed to economic depressions and wars. Now it may be contributing to secular stagnation and interest rates below economic growth rates. The low growth and interest rates are due to a relative abundance of capital or a relative lack of effective demand. When interest rates near zero, many economists fear that the zero-lower bound becomes a threat to economic stability. If the equilibrium interest rate that balances planned savings and planned investments is negative, a minimum interest rate of zero on money and debts can trigger a deflationary spiral with capital destruction and unemployment as money circulation in the economy slows down. In the wake of the Great Depression and World War II government interventions called fiscal policies and central bank interventions called monetary policies became increasingly popular. Minsky argued that a capitalist economy is inherently unstable and needs management. These policies were inflationary overall so that negative real interest rates were facilitated. Fiscal and monetary policies can have downsides such as the political business cycle where politicians try to make the economy perform well just before the elections. Monetary policies can distort financial markets as they can cause market participants not to price in risk correctly. The link between fiscal and monetary policies on the one hand and inflation on the other hand can be quite loose. The quantitative easing and government deficits in the aftermath of the financial crisis failed to produce high inflation. These policies counteracted deflationary pressures. Inflation may suddenly pop up when confidence in money and debts erodes. Nearly ten years after the financial crisis the world economy has recovered but interest rates remain low. Abundance of capital relative to effective demand causes deflationary pressures. Negative real interest rates may be unavoidable as soon as a new recession takes hold. Barring widespread capital destruction, interest rates may remain negative once this recession has ended. 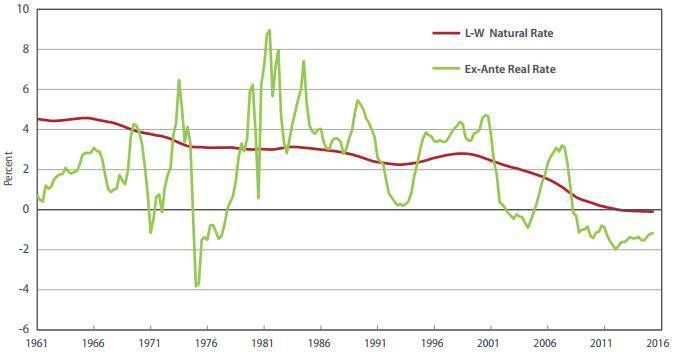 Natural interest rates went down in recent decades. The red line is the natural interest rate, which economic models assume to be the ideal interest rate for optimal economic growth. The trend towards lower interest rates is clear. The room for capital to grow is dwindling. In other words, usury may be creating the seeds of its own destruction. Similar conditions in the past were often followed by economic crises and wars causing capital destruction. Rebuilding that capital would then create new room for growth and positive real interest rates. The alternative to capital destruction might be allowing negative nominal interest rates so that there would be no crisis, war or inflation, and no erosion of trust in money. Most jobs currently done by humans may be replaced by machines in the future. Nuclear fusion may provide unlimited energy at a fraction of current prices. We may soon reach the limits of our desires if we pass our time in personal virtual realities needing fewer real goods and services, or the limits of our planet may start to affect economic growth. The ensuing deflationary pressures can be made manageable with negative interest rates. The end of usury could be near. Low and negative real interest rates can be a long-term development that may become permanent. Central bankers believe that low interest rates can persist for a longer period of time. This paper aims to explain the trend towards lower interest rates in recent decades in the light of usury, to make a prediction with regard to the general direction of future interest rates, and to explore the preconditions for interest rates to remain low and negative in the future. The research starts out with exploring the definition of usury and a short trip into history to illustrate relation between interest rates, inflation and financial capital stock, in order to see the relevance of the room for capital to grow for interest rates. It examines existing economic theories to discover which factors contribute to lower interest rates, and whether or not these factors are in place. • wealth effect, bubbles and risk. Some apparent logical contradictions may disappear after closer investigation. For example, the rule of law, political stability and economic stability can lead to lower interest rates, but also to higher economic growth, which promotes higher interest rates. This appears to be contradictory. However, as lower interest rates can improve the economy, it is the rule of law, political stability and economic stability that are dominant, so that the net effect is lower interest rates. If the interest rates had been higher, the additional economic growth wouldn’t have been possible. When you ask someone what usury is, the answer will probably be charging an excessively high interest rate. What is excessively high is a matter of debate. If you investigate the issue more closely, two types of arguments can be used against usury. First, usury might be undesirable from a social justice perspective. The morality of usury has been debated for centuries by philosophers and religious leaders alike. This paper focusses other argument, which is that usury is unsustainable in the long run and can cause financial instability. • capital stock growing faster than the economy. The traditional definition of usury that has been around for thousands of years is paying for the use of money. This applies to any form of interest and it was forbidden by some major religions like Christianity and Islam. The modern definition of usury is charging an excessively high interest rate because high interest payments can push people into poverty. Another argument against interest is that it compounds to infinite. If the number of money units is finite, charging interest can lead to wealth concentration and contribute to economic crises. Charging a fixed interest rate can cause financial instability as incomes fluctuate. For example, a corporation thinks of starting a project and expects to make 8% per year and it borrows in the market at 6%. If the project turns out to generate 4%, it makes a loss because of the interest payments, even when the project is profitable overall. And because interest is a reward for risk, people and corporations in trouble need to pay the highest interest rates, while they often need lower interest rates to get out of trouble. Capital stock growing faster than the economy can also be seen as a form of usury. This can happen when interest rates on capital exceed the economic growth rate and most interest income is reinvested. Piketty found that interest rates on capital were higher than the economic growth rate most of the time. This can be unsustainable in the long run as wealthy people save and invest most of their capital income. This type of usury is the main focus of the paper. Piketty found that in 1910 the amount of capital stock relative to national income in Europe and the United States was close to where it was in 2010. In the beginning of the twentieth century economists around the world like Hobson were concerned about lagging consumption or excessive saving caused by the concentration of wealth. Interest rates may have gone to zero in the 1910s if it wasn't for World War I. The war destroyed a lot of capital in Europe. The economy recovered after the war but then came the Great Depression. The amount of capital relative to national income in Europe hadn't yet recovered to pre-war levels so the Great Depression doesn't appear to be the result of a lack of room for capital to grow. 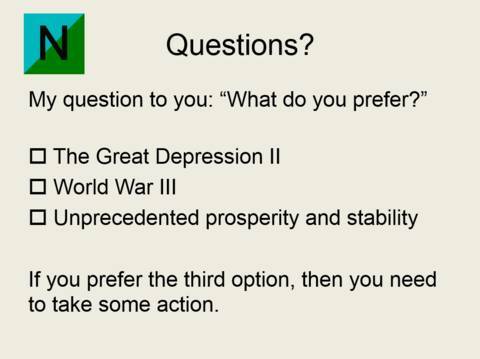 Many economists believe that the depression was caused by a lack of demand and policy failures of governments and central banks. Deflation took hold and interest rates became stuck at the zero-lower bound. Perhaps negative interest rates could have ended the depression. A German negative interest currency named Wara was banned in 1931 because of its success during the economic crisis. The success of the local currency in the Austrian town of Wörgl suggests that negative interest rates could have ended the Great Depression. It was banned too in 1933 because of its success. If these experiments had been replicated, the Great Depression may have ended earlier and World War II may not have happened. In the end World War II ended the Great Depression. The enlistment of soldiers and the production of war goods brought the economy in the United States back to full employment. Inflation in the United States picked up. Prices doubled between 1939 and 1948. Owners of financial capital incurred losses. In those years the S&P 500 stock index rose less than 20%, which wasn’t enough to keep up with inflation. Bond holders fared even worse. Yet, inflation pushed interest rates away from the zero-lower bound and the reduction of financial capital cleared the space for positive real interest rates in the years ahead. After the war Europe had to be rebuilt. This created new room for growth and positive real interest rates. When capital ran into the limits of growth again in the 1960s and 1970s, inflation picked up. This eliminated financial capital by eroding trust in money. Prices in the United States more than doubled between 1972 and 1982 and owners of financial capital incurred losses similar to those of World War II. Yet, this reduction of financial capital created new room for positive real interest rates in the years ahead. The inflation could be halted by cranking up interest rates so that real interest rates in the 1980s were the highest in recent history. There were other places where investors could make good returns. In the 1970s and 1980s growth in Japan and the Asian Tigers was high. In the 1990s and the 2000s Eastern Europe and China built their economy. Consumers in the United States and Western Europe went into debt. Lower interest rates combined with globalisation, efficient financial markets and innovations in risk management, allowed for more debt to exist. This propped up growth for a while but debt fuelled spending is not a sustainable path to growth. The financial crisis of 2008 can be seen as a warning sign. Trust in the future is the basis of the capitalist economy. Investors must imagine that the future will be better so that their investments be profitable or at least not loss making. Credit, or alternatively financial capital, is the outcome. Credit is given because of this trust in an imagined future. Most of our money is credit so the value of our money depends on imagination. Some people argue that credit, banking, and central banking are a fraud, because they are based on a fantasy. On can also say that the capitalist economy demonstrates what the human imagination can bring about. In order to have trust in the future, investors must believe that their investments are safe. The rule of law, political stability, absence of graft, and economic stability are basic factors for the economy to function. Political stability affects policy uncertainty, which is the risk that a government annuls earlier commitments. Policy uncertainty can impede economic growth. Government actions like confiscating or taxing assets can harm businesses and add to policy uncertainty. Inflation is another way of confiscating assets so government deficits are a cause of policy uncertainty. A wealth tax is a way of confiscating assets too. A wealth tax puts an upward pressure on interest rates. It could increase the minimum interest rate investors require in order to make good on the tax, unless the tax is global. If owners of capital don't have the option to evade the tax, the available amount of capital can reduce as funds are redirected from investment to consumption. Increased capital scarcity can cause interest rates to rise. Taxing capital and wealth should therefore be done with considering this effect. Reducing wealth inequality can cause rising interest rates as more money is directed from investment to consumption. An alternative to a wealth tax and redistributing income is to curb frivolous spending to reduce the consumption of energy and raw materials that are in short supply. As the wealthy have fewer spending options, they have even more funds to invest, so that interest rates can go even lower. The proceeds of the additional capital can be harvested by the not-so-wealthy via lower interest rates. The wealthy may then invest in renewable energy and materials recycling so that they have more spending options in the future. Interest rates are the lowest in stable countries with low inflation rates as trust influences the risk premium attached to investments. The greater the perceived risk, the more the future is discounted, and the higher interest rates are likely to be, and the lower the living standard is likely to be. Hence, Switzerland and Sweden have negative interest rates while Argentina and Mozambique have high interest rates. Interest rates in Europe are lower than in the United States, perhaps because of the Stability and Growth Pact that puts a constraint on government deficits. For most of history, returns on capital were higher than the economic growth rate. This cannot continue indefinitely unless a sufficiently large portion of the proceeds of capital is consumed. As the distribution of wealth in developed economies has become increasingly skewed in recent decades, this is not happening. Wealthy people invest a larger part of their income than people on average. Their inclination to save and invest was often what made them rich in the first place. They have a capitalist spirit. In a sense there is a battle between the spirit of capitalism and time preference. If the spirit of capitalism wins out, interest rates go down. If time preference wins out, interest rates go up. 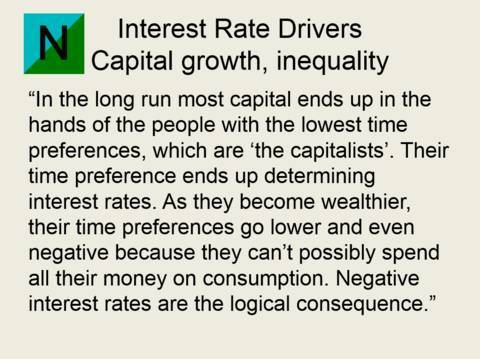 In a capitalist economy people with a lower time preference than the prevailing interest rate tend to save and invest, while people with a higher time preference tend to consume and borrow. At some point the people with higher time preferences pay a lot in interest and can't borrow any more so that they have less money to spend. Consequently, the economy may slow down and interest rates may go down. Then people with a somewhat lower time preference start to consume and borrow until they can't borrow more. This cycle can repeat as interest rates go lower because more people's preferences start to exceed the prevailing interest rate. But as the capitalists get wealthier, their time preferences go down even further because they can't spend all their wealth on consumption. As more and more people become indebted and can't borrow more, interest rates are driven down until they are determined by the people with the lowest time preferences. Income inequality can lead to political and social instability. The highest incomes often come from large estates so Thomas Piketty argued that wealth should be taxed and redistributed. Societies with more income equality tend to experience fewer social problems so a redistribution of wealth can improve political and social stability. On the other hand, many people are still poor and capitalism greatly contributed to the decline of poverty. Arguably, the abundance of capital may be accompanied by wealth inequality as the wealthy are more inclined to save and invest. The more income is redistributed from the wealthy to the poor, the higher interest rates can be as poor people tend to consume a larger part of their income. Hence, there will be fewer savings and interest rates can be higher. If governments fail to redistribute income, markets may react with negative interest rates so that wealth is redistributed from those who own assets to those who are in debt. There are a few confusions about the effects of lower interest rates on wealth and income equality. First, lower interest rates allow for more debt to exist. As a consequence many people borrowed more and their interest payments didn’t go down as interest rates went down. This borrowing and lending contributed to wealth inequality as the lenders were often wealthy people. As soon as interest rates go negative, income inequality can be reduced via interest payments. Second, as interest rates went down, the value of investments such as bonds, stocks and real estate rose, so that it is argued that lower interest rates contribute to wealth inequality. The appreciation of asset values is due to realised interest gains. If interest rates had remained higher, the owners of these assets would not have seen their assets rise in value, but have received more dividends, interest and rents, and they could expect to receive more dividends, interest and rents in the future. Third, different investors make different yields on their investments. The interest rate on capital is some kind of average. On average, wealthy people make higher yields on their investments because they have better information and can afford to take more risk. This means that even at interest rates near zero, wealth inequality can contribute to income inequality. Interest rates may need to go even lower for this to end. And they may go even lower as a consequence, for wealth inequality reduces the potential for the economy to grow. Most people pay more interest than they receive. The interest paid on mortgages and loans is the proverbial tip of the iceberg. Interest is hidden in rents, in taxes because governments pay interest on their debts, and the price of every product and service. German research has shown that 80% of the people pay more in interest than they receive, while only the top 10% of richest people receive more in interest than they pay. Lower interest rates therefore benefit most people despite a number of side-effects that work in the opposite direction. There is a demand for money because it is the most liquid asset. This is called liquidity preference. Money can be exchanged for other goods and services the most easily so money commands a position of power. People keep money on hand for their daily transactions, unexpected large expenses, and investment opportunities that may arise. They are not willing to lend this money unless it can be called in at short notice. Fractional reserve banking enabled banks to lend out money that can be withdrawn on demand. This freed up funds for investments and helped to lower interest rates. A fractional reserve bank creates money. Not only the loans can be used as money, but so can the deposits that fund them. Fractional reserve banks can run into trouble when too many depositors withdraw their funds. The quality of the fractional reserve money greatly depends on the possibility to exchange it for currency and gold at any time. If debt can receive a status similar to currency and gold, this would undermine the bargaining position of owners of currency or gold. To improve the stability of fractional reserve system, central banks help out fractional reserve banks that run into trouble. This safety net allowed interest rates to go lower as central banks reduce the risk associated with bank deposits. Central banks can add currency to the banking system. This may be needed to cope with the accumulation of interest. The money to pay for the interest from doesn’t always exist and may need to be created out of thin air, either by creating new debts or by printing currency. If there is a reserve requirement, central banks need to print currency to maintain a ratio between debt and currency in the banking system. An important criticism of fractional reserve banking and central banking is that lower interest rates promote bad investments and moral hazard. If interest rates go higher, some investments are not profitable any more. This argument rests on the assumption that interest rates will go higher. Central banks reduce the risk premium so it is also argued that central banks push interest rates below their free market level because risk is not priced in correctly. Indeed, there is a moral hazard attached to central bank guarantees, but the increased financial stability appears to be a greater benefit. More recently it is argued that central banks with their extraordinary measures like quantitative easing, have suppressed interest rates, for example by buying up government bonds. When interest rates on short term funds are near zero, markets cease to operate in a normal way because of the zero lower bound and the liquidity preference. Under normal circumstances printing money would produce inflation and interest rates would rise due to inflation expectations. Nevertheless, central banks printed currency and interest rates dropped because the new currency may not have been spent but may have been used as a substitute for the bonds. Had it been possible to implement negative interest rates on short term money, these measures may not have been needed, and the market could have set the price for these bonds. The globalisation of financial markets in recent decades was made possible by advances in information technology and financial innovations. In the 1980s and 1990s financial markets were liberalised and capital controls were gradually removed. Capital controls can lead to higher interest rates and thus increase the cost of capital. Globalisation and liberalisation expanded the available borrowing and lending possibilities throughout the world. The increased competition reduced the cost of financial intermediation. Globalisation and liberalisation made financial markets more liquid. It became cheaper and easier to exchange financial instruments such as bonds and stocks but also goods and services for cash. This development is more commonly known as financialization. Financialization makes it easier for people and businesses to rationalise their assets and income flows using financial instruments. Like fractional reserve banking financialization undermined the position of money as the most liquid asset and hence the commanding position of the owners of money to demand interest. The process of globalisation and liberalisation of financial markets wasn’t without trouble. It enabled money and capital to move more freely so that changing expectations could more easily cause financial instability. A number of financial crises in the 1980s, 1990s and 2000s were neutralised by central bank interventions. Lower interest rates in developed economies made investors look for higher yields elsewhere. But trust in emerging markets could suddenly evaporate. Some countries used capital controls to counter financial instability. Malaysia introduced capital controls during the Asia crisis of 1998. China never stopped using them. Better risk management allows banks to increase their lending. With more funds available, interest rates can be lower so that better risk management can contribute to lower interest rates. Financial innovations such as credit derivatives improved the risk management of banks, which allowed banks to lend more money. This remains true after the financial crisis of 2008, despite the fact that a poor use of derivatives contributed to the crisis. Banks with larger gross positions in credit derivatives cut their lending by less than other banks during the crisis and had consistently lower loan write-offs. Lower interest rates allow for more debt to be serviced. Higher debt levels give less room for interest rates to rise as higher interest rates will affect aggregate demand. This dynamic puts a downward pressure on interest rates. Whether or not people actually go into debt doesn’t depend on interest rates alone. Nevertheless, as interest rates went down in recent decades, consumers in Western Europe and the United States took on more debt. This is attributed to the wealth effect. As interest rates went down, the value of investments rose and many people felt wealthier so that they adapted their lifestyle. Rising house prices contributed most to the wealth effect induced consumer spending. This propped up spending at a time when labour incomes were lagging because capital income was taking up a larger portion of national income. The debt binge further contributed to wealth inequality as these debts became interest bearing assets for investors. Higher and even steady interest rates will reduce aggregate demand so that interest rates are likely to down. It is sometimes argued that central banks have lowered interest rates in order to create asset bubbles so that wealth effect induced spending could prop up the economy. A more general criticism is that central banks distort the market mechanism and support irresponsible behaviour, most notably in the form of higher debt levels. Banks make funds available for lending and central banks reduce the risks associated with banking so that interest rates can go lower and people and businesses can take on more debt. The risk premium that central banks eliminate was clearly visible after the financial crisis of 2008. At first interest rates spiked, only to go to near zero after central banks intervened so that a liquidation of debts never took place. In the absence of structural reforms, the Eurozone was at risk of unravelling in 2012. The President of the European Central Bank then stated that the ECB would do whatever it takes to save the euro. This reduced the risk premium on the government bonds of countries that were facing a debt crisis. If creditors keep on accumulating credits then interest rates may go negative. At that point debtors will have fewer problems servicing their debts. Perhaps a balance can be achieved where the ratio between capital stock and GDP is stable. An alternative is inflation, but inflation erodes trust in money and the financial system. Low interest rates are a sign of trust so that negative interest rates appear more attractive than inflation. That is because real interest rates could be lower in absence of a risk premium for unexpected inflation so that more capital can be maintained. Income inequality may hamper the economy so interest rates may go lower so low and negative interest rates can become the new normal. The factors contributing to lower interest rates will probably remain in place. Our civilisation and wealth rest upon the trust in the capitalist economy and the financial system like never before. That is the message low interest rates may give us. Higher interest rates may mean a destruction of trust reflected in financial capital and this can have grave consequences. Trust may suddenly evaporate and could then be hard to restore. Measures to stimulate the economy, such as deficit spending and printing money, promote inflation and can push interest rates higher. Once the inflation genie is out of the bottle, it may be hard to put it back in. Higher interest rates can hurt the economy, either by reducing aggregate demand or by undermining confidence in debts. Investors may then seek an additional risk premium when economic instability makes it more difficult to foresee future policy actions. Rising interest rates may coincide with poor economic performance, inflation and economic instability. Stagflation like in the 1970s may be the best one can hope for if this path is chosen as it may not be possible to overcome the deflationary pressures of the outstanding debt load without serious consequences like a world-wide economic depression or a major war. So why don't economists see the great potential of negative interest rates? That may have something to do with scarcity being the main pillar of economic thought. From scarcity follow positive time preferences, hence positive interest rates. Yet, economists should question scarcity at a time when more people are dangerously overweight than underfed. At least scarcity doesn’t apply to the wealthy top 1% of people who own most capital and have the largest influence on interest rates. They are running out of investment options. The economic world could be turning upside down and interest rates may go negative. 1. Minsky, Hyman Philip (1986). Stabilizing an Unstable Economy. Yale University Press. 2. Nordhaus, William D. (1975). The Political Business Cycle. The Review of Economic Studies Vol. 42, No. 2 (Apr. 1975), pp. 169-190. 3. Miller, Marcus H., Weller, Paul A. and Zhang, Lei (2002). Moral Hazard and The U.S. Stock Market: Analyzing The 'Greenspan Put'. Institute for International Economics Working Paper No. 02-01. 4. Lubik, Thomas A., Matthes, Christian (2015). Calculating the Natural Rate of Interest: A Comparison of Two Alternative Approaches. Federal Reserve Bank of Richmond Economic Brief October 2015. 5. Fischer, Stanley (2016). Monetary Policy, Financial Stability, and the Zero Lower Bound. Federal Reserve. Speech at the Annual Meeting of the American Economic Association, San Francisco, California. 6. Piketty, Thomas (2013). Capital in the Twenty-First Century. Belknap Press. 7. Hobson, John (1909). The Industrial System: An Enquiry into Earned and Unearned Income. 8. Lietaer, Bernard (2001). The Future of Money: Creating New Wealth, Work and a Wiser World. Random House. 9. Friedman, Milton, Jacobson Schwartz, Anna (1980). From New Deal Banking Reform to World War II Inflation. Princeton University Press. 10. Baker, Scott R., Bloom, Nicholas, Davis, Steven J. (2013). Measuring Economic Policy Uncertainty. Stanford University. 11. Ramsey, F.P. (1928). A Mathematical Theory of Saving. Economic Journal 38 (1929), pp. 543-559. 12. Alesina, Alberto, Perotti, Roberto (1996). Income distribution, political instability, and investment. European Economic Review 40(6): 1203-1228. 13. Pickett, Kate, Wilkinson, Richard (2009). The Spirit Level: Why More Equal Societies Almost Always Do Better. 14. Kennedy, Margrit (1995). Interest and Inflation Free Money. Seva International. 15. Keynes, John Maynard (1936). General Theory of Employment, Money and Interest. Palgrave Macmillan. 16. Edwards, Sebastian (1999). How Effective are Capital Controls? Anderson Graduate School of Management, University of California. 17. Issing, Otmar (2000). The globalisation of financial markets. European Central Bank. 18. Norden, Lars, Silva Buston, Consuelo, Wolf Wagner (2014). Financial innovation and bank behavior: Evidence from credit markets. Tilburg University. 19. Case, Karl E., Quigley, John M., Shiller, Robbert J. (2005). Comparing Wealth Effects: The Stock Market versus the Housing Market. Yale University & NBER.